When Google first entered the search engine business, one of the unique features of its search algorithm was that it considered each inbound link to be a “vote” for a particular website. If two thousand bloggers link to a CNN article about fried chicken, for example, then the next time someone Googles the term “fried chicken,” that CNN article is far more likely to be near the top of the search engine results. Google considers inbound links to be a vote of confidence in the content and credibility of a given website. The more inbound links a website had, the higher it ranked in the Google search results. Today, the quality and relevance of the link matters just as much as the link itself. In other words, Google's search algorithm will ignore “spammy” links to your website from a link farm, but will rate highly a link from a well-reputed blog within the same industry as your business. Link building is two parts art, one part science. While keyword optimization for websites is a relatively straightforward process of calculating the correct keywords and placing them within pages at the correct density, link building is more time-consuming and requires more finesse. Because link building requires a serious, long-term commitment, it's not easy to maintain it in-house unless you already have a dedicated Internet marketing department. 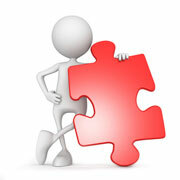 Therefore, call upon the experts at our company to run and maintain your link building campaign for you.